My fellow Nutmegger and blogging buddy extraordinaire, Ms Maggie Moo , has taken up a noble cause and is going to be participating in the American Cancer Society's Making Strides Against Breast Cancer Walk this October. 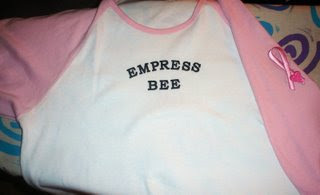 She is walking in the name of another blogging buddy extraordinaire and all around great gal, Miss Bee, for whom she has named her team in honor of - "Empress Bee". If you are able and haven't already, please donate to this fund raiser by clicking here. Mags is very near her goal of raising $1,000 and every little bit helps attain this goal, with your help I'm sure she can reach it and beyond! just five bucks each would make it so easy!! give it a try, you will feel wonderful!